The Activa Sensor Array provides flow, temperature and pressure signals in a compact unit that requires only one hydraulic line break. Each sensor transmits an output signal that is easily integrated with PCs, PLCs, recorders or panel displays. 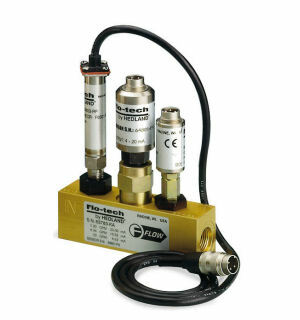 Signals can also be transmitted to Flo-tech’s F6700/F6750 Series digital displays.Typical applications include fluid characteristic measurement on test stands, stationary hydraulic system monitoring, feedback for hydraulic system control, advance warning of impending component failure and mobile hydraulic system diagnosis.